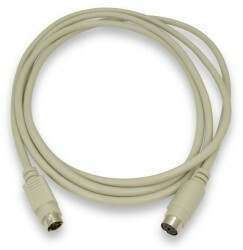 These extender cables will give your PS/2 keyboard or mouse a longer leash! These are perfect for when your PC case is behind your desk or tucked away somewhere and you need a longer cable. One end of the cable has a 6-Pin Mini-DIN Male connector and the other end has a 6-Pin DIN Female socket. The 6-Pin Mini-DIN style connector is standard on most recent PCs and is smaller than the older 5-Pin DIN style. The cables are 6 feet in length.